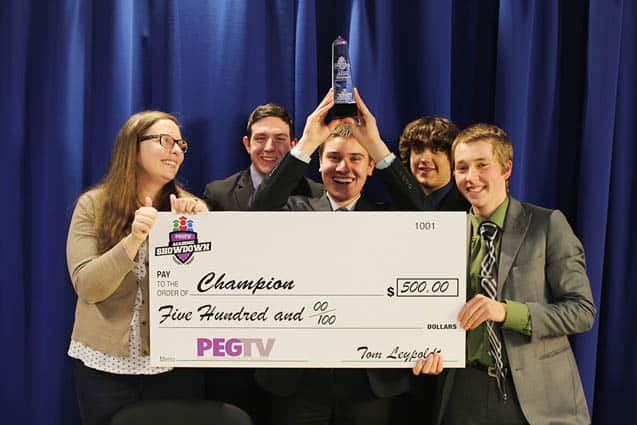 Fair Haven coach Torrey MacGregor celebrates a first place finish with her team, pictured (L-R): Isaac Nichols, Charlie Cacciatore, Zachary Caraballo and Trevor Reck, during PEGTV’s first annual “Academic Showdown” quiz show competition. RUTLAND—A champion was crowned during the finale of PEGTV’s inaugural season of quiz show “ Academic Showdown ”, which aired April 7. In front of a live audience, Fair Haven Union High School and Otter Valley Union High School battled it out in a boys-versus-girls finale. Fair Haven students Charlie Cacciatore, Trevor Reck, Zachary Caraballo and Isaac Nichols emerged as victors, with a final score of 220-115. Otter Valley students Ghislaine Robin, Jonna Keith, and Brigid Enright proved to be worthy competitors and both teams kept up a fast pace, answering questions as fast as host Mitch Golub could read them. It was an exciting end to the first season, and already schools are looking forward to participating in season two. Repeat airings of the finale can be seen on PEGTV Channel 20 on Saturday, April 9 at 6 p.m. and Sunday, April 10 at 8:30 a.m. All seven episodes will be available to watch online at pegtv.com beginning May 1. For more information on “Academic Showdown” or any of PEGTV’s programs, visit pegtv.com.